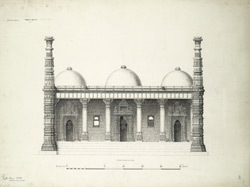 Plan of the Gumti Mosque at Isanpur near Ahmadabad, Gujarat. The Gumti mosque, located three miles south from Ahmadabad's Astodiya Gate, can be found near the Jethabai vav or well. The Gumti mosque does not have a front wall, and is open in front. The interior is supported by a front row four pairs of coupled pillars and four other single pillars along the middle section. These pillars support the two rows of three domes. Along the back wall, there are three mihrabs or prayer niches, which were once richly carved and now defaced. Two solid minarets with carved decoration, each approximately 27 feet in height, are located on the extreme ends of the façade.